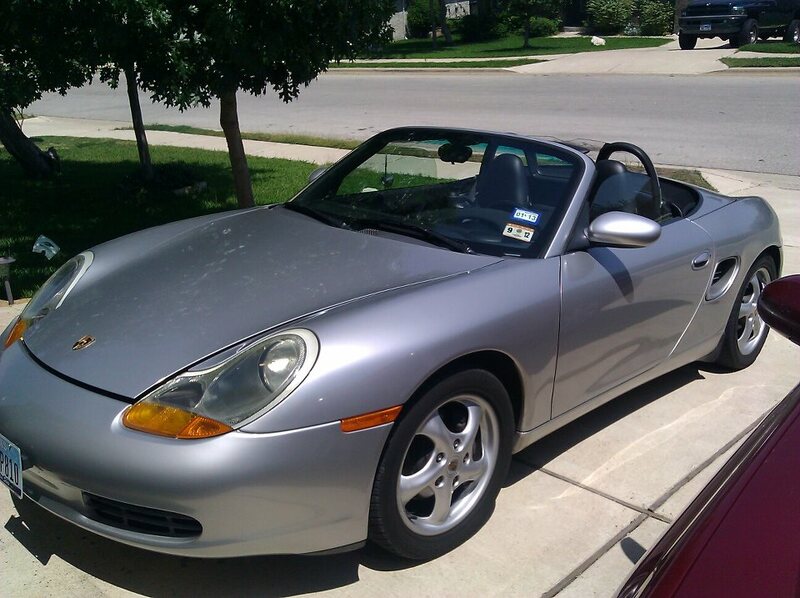 I have a 97 Boxster for sale. Bought it 6 years ago just as a fun car. I just don't have time for it, and I don't want it to sit around and not be driven. The car has right around 75K original miles on it. I've only put 10K on it in the 6 years I've owned it. Overall, the body is in excellent shape. I am always open and honest and will be happy to tell you about the things I know are wrong. Someone that enjoys working on these cars will love this one. 1. Just found out the spoiler motors are apparently gone out. When the positive batter cable is hooked up, the spoiler motor knocks. I pulled the fuse for now to stop that. 2. The back window has come unsewn on about 1/2 the window. Was going to take over to my local upholstery shop to get it repaired, but don't know if it's worth it. The top itself is in great condition, and the window is still very flexible. 3. The steering wheel needs to be replaced. The cover is worn and the airbag assembly has warped, and when the fuse is in, the horn contact makes the horn blast continuously. Luxury car shop said it's common, and replacing the steering wheel and airbag assembly will fix the problem. This is all I'm aware of at this time. As I mentioned the body itself is still beautiful. I just recently applied a headlight restoration kit, so they're very clear at this time. Would like around $4,000 since it has such low mileage for its age. I got a quote for the window resew of $275, and the spoiler assembly is available online for <$200. Steering wheel is a bit more, but, like I said, for someone that enjoys working on these cars I don't think it will be too difficult. I'm located just outside Austin Texas. Anyone interested will have to come by in person to pick up the car. Do you still have the car? I'm up in Kansas but it's short drive away.